Does my home’s air conditioning need an annual inspection? What should I do if my AC system isn’t working properly? Why are DIY or handyman repairs a mistake? Like all of the mechanical systems in your home, your air conditioning equipment is highly technical and complex. It requires regular maintenance and may need repair services from time to time. Manufacturers of AC systems popular in Texas invest a great deal of time and care on engineering and manufacturing to ensure that their products are reliable and efficient. The limited warranties they provide assure you that you can rely on trouble-free operation for many years after installation. Like your automobile, however, you must have regular scheduled maintenance, along with expert repairs when problems develop. Only highly trained, professional technicians should be trusted to work on your equipment. Every air conditioner manufacturer recommends that their equipment be properly maintained, typically on an annual basis. 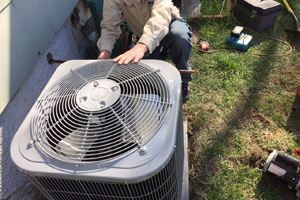 That maintenance includes cleaning of condenser and evaporator coils, diagnostic tests using state-of-the-art equipment and checks of refrigerant levels and proper operation. The experienced technicians employed by your trusted AC contractors have the equipment, parts and skills needed to perform these regular checkups properly. By spotting problems early, they can also make affordable repairs that prevent costly failures. Regular maintenance keeps your system operating efficiently to save money on your energy bills. If your AC system isn’t working or is not cooling your home adequately, that’s a symptom of a problem that should be corrected as soon as possible. Whether you live in the San Antonio area, the Houston metro region or in the Dallas Fort Worth area, you shouldn’t neglect these problems and let them lead to an equipment failure. Instead, call a trusted contractor and report the problem. They’ll send a thoroughly trained technician to your home to diagnose the problem using specialized test equipment. After discussing what they find with you, they’ll tell you what repairs are needed and give you an estimate on the cost of the fix. In most cases, they’ll have any parts needed right in their van, and your system will be working again quickly and at a reasonable cost. Homeowners throughout Texas take great pride in doing a lot of their own home maintenance and often save a lot of money. Others rely on local handyman services to handle routine home maintenance and repair jobs. When it comes to your home’s heating and air conditioning systems, though, that’s always a mistake. HVAC equipment today is complex, computer-operated, and requires special diagnostic equipment, specific tools and the correct original equipment manufacturer’s parts. Amateur repairs can lead to serious breakdowns and create safety issues. Only professional, certified HVAC technicians have the right parts, tools and extensive knowledge and training to handle these jobs. If there’s a problem with your AC or heat pump unit, call a licensed heating and air conditioning company in your Texas community. Get the job done right. How Much Do Typical Air Conditioning Repairs Cost? There’s no simple answer to this important question. It all depends on what repairs are needed. The most common problems Texas homeowners experience with the AC and heat pump systems are usually simple and not costly to repair. An experienced technician uses diagnostic equipment and experience to identify the problem and then provides a cost estimate before making any repair. One thing’s certain, though. Small problems can lead to an equipment failure that requires replacement of the entire unit. The cost of repairs is always lower than replacement. Your best value is trusting a fully trained professional technician to handle the job promptly and efficiently. You’ll save in the long run by extending the life of your investment. How Long Do I Have to Wait for Replacement Parts? There are many manufacturers that make central, ductless and geothermal heating and cooling equipment, including Carrier, Goodman, Lennox, Trane, Bryant, American Standard, Daikin, Payne, Rheem, Amana, Armstrong, Magtag, Coleman, Fujitsu, Mitsubishi, Ruud, Heil, Comfortmaker, Janitrol, York, Samsung, Kenmore, Centurian, Whirlpool, Toshiba, Haier, LG, Emerson, ClimateMaster, GeoComfort and WaterFurnace. A reputable company should have direct and quick assess to replacement parts and there should be no delay in getting the problem fixed. Most technicians have replacement parts in their vans when they arrive at job sites. For regular maintenance and repairs on any residential air conditioning or heat pump system, finding a trusted, certified repair technician is as easy as using the AC contractor listings on this website. Here, you’ll find proven HVAC contractors across Texas, from La Porte, Richmond and Spring to Sienna Plantation, Bellaire and Cinco Ranch in the Houston area, from Burleson, Forney and Hurst to Frisco, Euless and Cleburne in the Dallas Ft. Worth area, and from Timberwood Park, Helotes and Jourdanton to Fentriss, Gruene and Hedwig in the San Antonio area. You can count on them for a prompt, courteous diagnosis, a competitive price estimate and fast repairs to restore comfort to your home. Whether you cool your home with a central ac system or an efficient ductless mini-split system, protect your investment by insisting on professional maintenance and repair services.